History of Hampi is very interesting like a typical rise and fall of a kingdom, then being recovered to become one of the most visited tourist places in Karnataka. If made into a movie, it has all the right ingredients, people would love to enjoy. The story of Hampi began in 14th century with the rise of Kampili and their kings who had ruled what's now modern Anatapur, Chitadurga, Shimoga, Raichur, Dharwad and Bellary districts. The Kampili kings were attacked repeatedly by the Muslim rulers and by 1326 it was captured by Muhammed-bin-Tuglaq who had already captured the neighbouring kingdoms of Devgiri. Among the prisoners taken from Kampili were the brothers Harihara and Bukka who had been officers in the treasury in their kingdom. They swore allegiance to the Sultan and was sent back to their kingdom to subdue some rebels, but they threw off the deal and set up a kingdom of their own. Harihara was helped and assisted by his brother Bukka and on the advise of a sage Vidyaranya of the Sringeri Math to built a kingdom on the southern banks of river Tungabhadra, opposite the Anegundi fortress. The kingdom stretched from the eastern coast (present day Andhra Pradesh) to the western coast (which is now Karnataka). The new city was names as Vijayanagara which meant the city of victory. The brothers reigned as the sons of Sangama, and stated their dynasty as Sangama Dynasty. Their heraldic crest, a boar represented an incarnation of Lord Vishnu. The brothers patron diety was Lord Shiva's form Virupaksha, the Lord of the world. The Vijayanagara kingdom grew with the Sangama Dynasty with each successive ruler, making a mark and leaving fortunes. Bukka was credited for laying the foundations of a brilliant irrigation system of which some of the traces can be found even today. Harihara was known for laying the foundations for an efficient administrative system. During Bukkas sons reign the Vijayanagara Empire grew to its best powerful form, enough to overthrow the Muslims rulers and establish Hindu rule over the southern part of India. The growth of the empire was such that there were lot of foreigners who appreciated the beauty and richness of Vijayanagar. As the saying goes all good things come to an end, this period of growth of the Vijayanagar kingdom came to stagnation, because of a few weak kings, and the Sangamas were replaced by the Saluvas. They were then followed by the Tuluvas dynasty who had been generals of the previous dynasty. After some time of their reign, again the wheel of fortune turned on them and Vijayanagar kingdom was blessed with a king who is remembered till date he is Krishna Deva Raya. Krishna deva raya ruled for less than 20 years, but he re-established the supremacy of the kingdom over south India. He was a very efficient ruler who set the standard for perfect governance. He was also an accomplished scholar and poet, whose work figures among the best literary works of his era. Krishnadeva raya has done magnificent gifts to temples and done lot of contributions. He was an ideal ruler of Vijayanagar. He life was short, after his death there was confusion and anarchy and the rulers and they fought among themselves, this gave a leverage to the muslim rulers and they started flanking the empire on all sides. The city was raided and was systematically, ruthlessly destroyed by the attackers. The city of Hampi came to ruins in 1565. Hampi in ruins, with most of the temples and structures almost destroyed was taken over by the UN organization, UNESCO to preserve and maintain what was left behind. It has taken the responsibility of restoring a few monuments and structures and help the welfare of the people residing in Hampi. 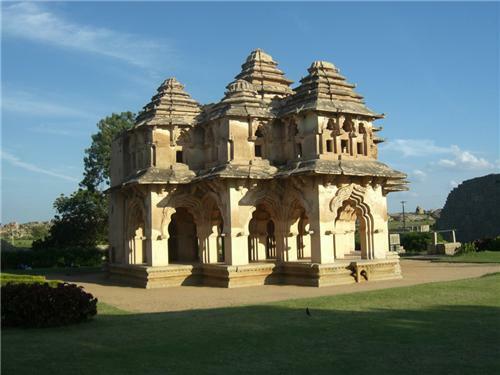 Since Hampi has lot of temples and palaces and is a major tourist attraction it is considered as a World Heritage Site. thanks ...this info was really helpful for my project and presents the entire history of the empire with reference to the art of hampi in a jist.